This Sunday, one of my best friends is running the New York City Marathon. She asked me what the course was like and as I was mulling over what to tell her, I realized… I have so much to say about this race that it must live on, forever, right here. 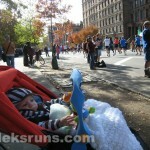 So here it is, a race recap that takes place a full decade after the fact. 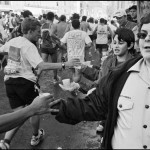 And with the caveat that the last time I ran this race was in 2006, let’s grab a drink and take a walk (run!) 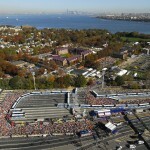 down memory lane: all 26.2 miles of it! Head to line up in your corral early: there are so many thousands of runners, you’ll have trouble finding it if you wait too long. And enjoy the exhilarating atmosphere. Helicopters flying overhead, the national anthem blasting over the loudspeakers and, as soon as the start gun goes off, Frank Sinatra’s New York, New York sends you off across the starting line and gives you goosebumps. You’re about to run the race of your life! The first (almost) two miles are on the Verazanno-Narrows bridge and the views are amazing. Your heart is pumping wildly – a combination of adrenaline and the slight incline of the first half of the bridge, but that’s only to be expected. Depending on your corral, you will run on the upper or lower level of the bridge – if you’re on the lower level (usually the slower corrals), try to stay to the sides so you can enjoy the sights better. Don’t pay any attention to the fact that the bridge is shaking – because it is! – it’s not going to fall. Around Mile 3, you will run under a freeway overpass – look up and wave to the spectators, who probably drove there and lined up to cheer you on! Read and learn, West Coast: people make it their job on this Sunday to go out and spectate! Almost every inch of the course is crowded, in some sections five-plus people deep, with loud, screaming fans. It gives you wings! Photo credit: Richard Kalvar. 2004. Fourth Avenue, Bay Ridge, Brooklyn. 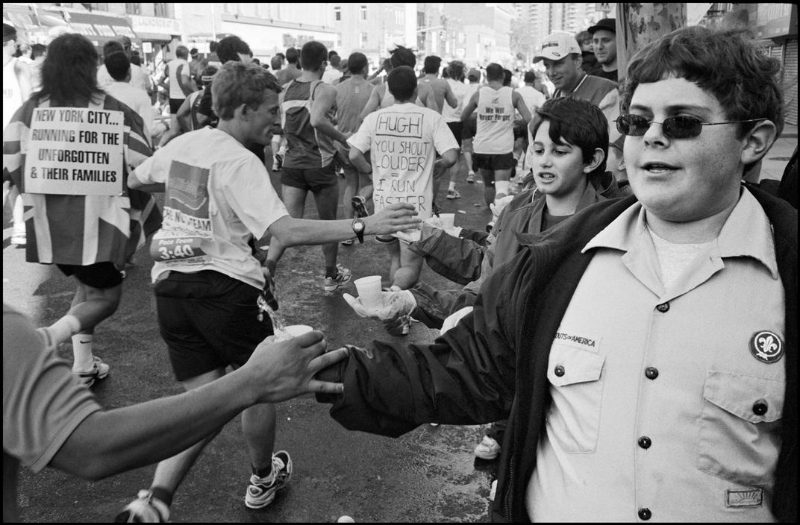 Boy Scouts distributing water to the runners. Technically, you set foot in Brooklyn the minute you’re off the bridge around a little before Mile 2, but the real fun part of Brooklyn begins as you merge onto Fourth Avenue, right around Mile 4. The crowds are large and the music is loud! At least one house will be blasting the YMCA song – sing and dance along! High-five the kids lined up with their little hands extended, say hello to the New York City marathon veterans who will be there, too, cheering you on and wearing their medals round their necks. Not for long, you’ll have one too! And if that’s not enough to occupy overwhelm your mind, try counting down the cross-street numbers, all the way from the 90s to the single digits. You really are running that far! You will run through Williamsburg and Greenpoint: two neighborhoods that changed so much in the last five years that I really cannot describe that portion of the course. There will be tree-lined streets with stately brownstones: the trees all yellow, orange and red, and the brownstones: beautiful deep brown. It’ll be lovely! 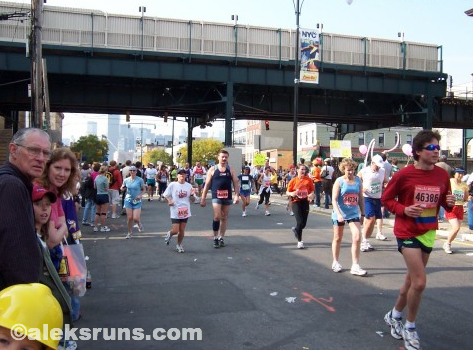 And before you know it, you will find yourself running over Pulaski Bridge — and into Queens! Congratulations, you’re half way through! Somewhere in Queens? I don’t know… Could also be Brooklyn. 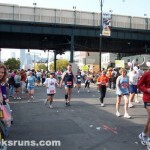 Photo from my 2003 race, you can see me on the left, dressed all in blue. To be perfectly honest, you will probably be glad the Queens portion of the course is only two miles. It’s all fun and games cheers, but there will be no brownstones or other interesting stuff to look at. I don’t remember much else about it, and I guess that says it all? Between miles 15 and 16, you will cross the 59th Street Bridge. It’ll be tough, I won’t lie. The bridge is covered, and it’s dark, damp and cold. Only two things you can do: listen to music, if you have it, and power through it — or listen to the music hundreds of runners make as they run with you! And if someone starts clapping – happened both times I ran there! – join them! Soon, everyone will be clapping, and shouting, and whoop-whooping and it will be fun again! Yet, you will be thinking, Will that bridge never end? And then you’ll hear it. The crowd! The crowd as you exit the bridge and turn towards First Avenue in Manhattan… it’s crazy. Crazy loud, and crazy exciting, and just so amazing that you’ll want to cry. And probably will. Savor that moment. Thank the crowd (even if they can’t hear you). All those people – hundreds! thousands! – are screaming their lungs out for YOU! The roaring crowds may thin down a bit – just a wee little bit – over the next three miles, but fear not: the cheers are loud, the spectators are happy (and many of them, drunk), and the running is fun! You’ve got plenty of miles on your feet already, but you’ll be busy smiling at everyone and feeling like a rock star! Count the cross streets if you need to occupy yourself, from 59 all the way to 125. Fun! This is the tough part. Things may have changed in recent years (and I noticed a difference between 2003 and 2006, even), but typically there are fewer people there. After the noise and crowds of First Avenue, you’ll feel kind of lonely… and you’ll remember you’re tired. Don’t give into negative thoughts, though: it’s only two miles! And be on the lookout for a section of the road — it’s either right before or right after the next bridge you’ll cross, back into Manhattan — that has the flags representing all runners’ countries. If you’re not from the U.S., find your country’s flag, touch it. Let it give you strength and push you through the wall! I used to live right along that part of the course, so I’m biased… but it really is a beautiful place to run! Don’t let the fact that you’re tired and cranky and want to be done already take away from this part of the race! Enjoy the beautiful brownstones of Harlem — and as you turn right on 5th Avenue and 124th Street, look to your right and wave to the nuns ringing their bells and sending blessings to all runners. 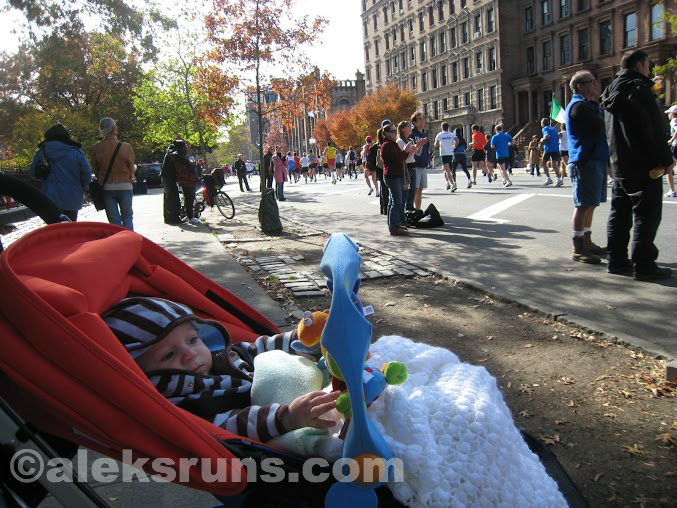 BabyRuns is spectating his first New York City Marathon, back in 2008. 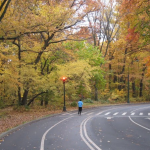 And no, that park you’ll see at Mile 22 is not Central Park. But soon. You’ll be there soon! You’ll run along Fifth Avenue for a while: on your left will be towering limestone buildings, and you’ll wonder, are people watching the race from the windows of their multi-million-dollar penthouses? They probably are. And on your right will be Central Park! Count down the streets, from 110 to 90, and that is where you turn right and enter the park. This section is further up north and not on the marathon course, but you get the idea. And if that’s not enough, just listen to the crowd. It’s back to four-five deep and happy and loud! Let the crowd carry you through those miles and you won’t need anything else! Miles 25-26.2: The Final Stretch! 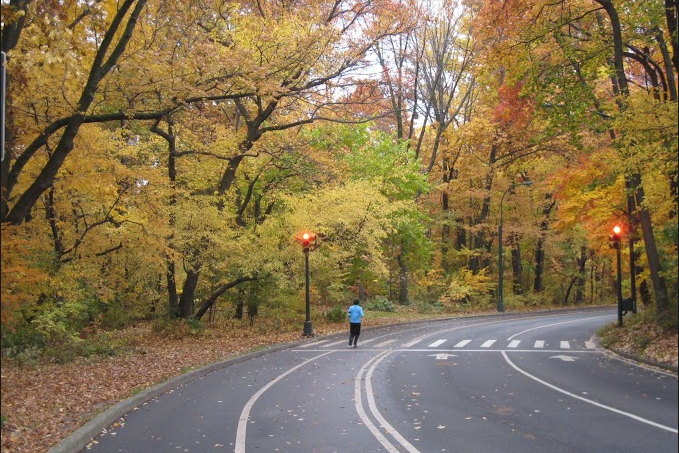 You’ll exit the park here and run along Central Park South for four avenue blocks – from the Plaza Hotel to Columbus Circle, where you’ll turn right again, and back into Central Park for the final stretch. I will not describe the final stretch. You will have to experience it yourself. 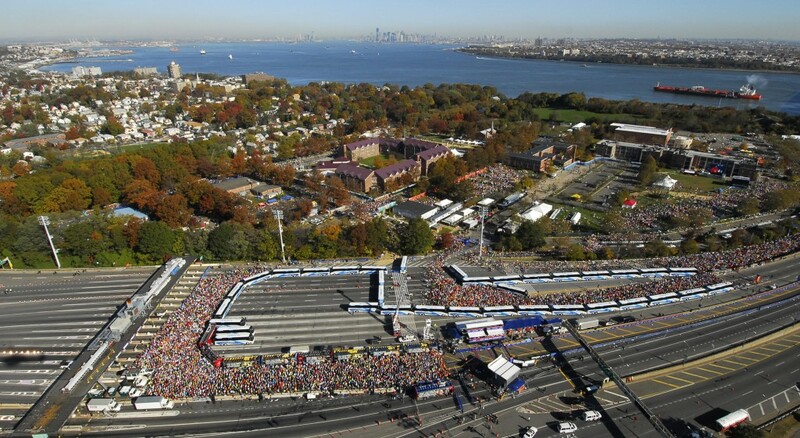 It is the most amazing final stretch of any marathon you ever ran, and that is that. If I’m wrong about this, by all means tell me and I’ll sign up for that race on the spot! You will cross the Finish line, and a volunteer will put a medal around your neck, and you will begin the slow, painful – but elatedly blissful – one-mile journey through the park, to the family reunion and bag pickup area (if they still have those). People around you will limp, some will cry, but most will be quiet, and you will listen to the rustling of those finisher blankets, for which you’ll be grateful. You’ll need the warmth! Then you’ll reunite with your family and friends, have a bite to eat and you will likely take the subway back home or to your hotel (since all the streets are still closed anyway). The perfect New York City ending to the perfect New York City day! One extremely unflattering photo of me, but a favorite nonetheless: After the 2003 marathon, my friend Lisa is eating my post-race banana (and medal! ), while we’re both sitting on the ground completely oblivious to the fact that someone has already… um, gotten sick right behind us. Cheers! Love this. I’m going to apply for 2014! Me too! We can, and should, repeat in 2015! That’s a great recap! I’ll never run a marathon, but this sounds like a good one!